After finishing the second page of Use Your Illusion, I stopped. I wasn’t sure if I wanted to go through with it. I felt like I had typecast myself, and should do something new, something with more action, something that wasn’t an optimistic story filled with round-faced children. I contacted my brother (a far better writer than myself) and he promised to give me a story to work with. Sanae (male cosplayer with amazing outfit): Your Toho books are awesome. I’ll take one copy of each. Sanae: What’s your next book going to be like? Sanae: And of course it has Sanae. Me: It’s a rule on Pixiv that all Youmu x Reisen pairings must be moderated by Sanae. 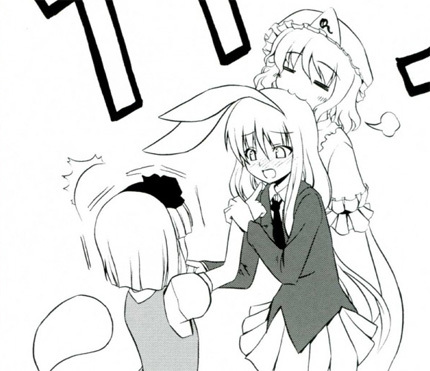 Me: And Sanae turns into a small catgirl, and proceeds to troll the crap out of Youmu and Reisen. Sanae: Wait, you know that doujin? Me: Nyan-Pani, by Soichiro Hoshino. 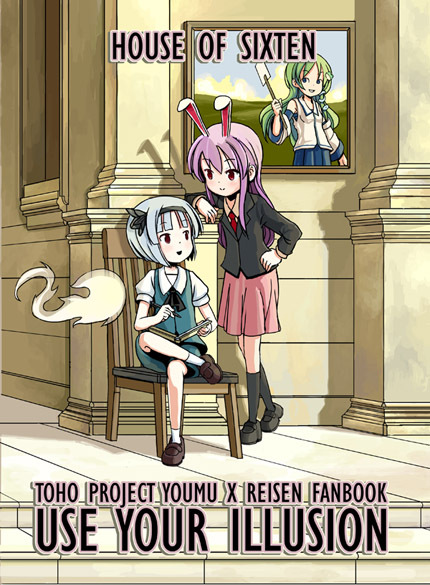 Sanae: I approve the hell out of your Youmu x Reisen book. You better have copies for sale next year. 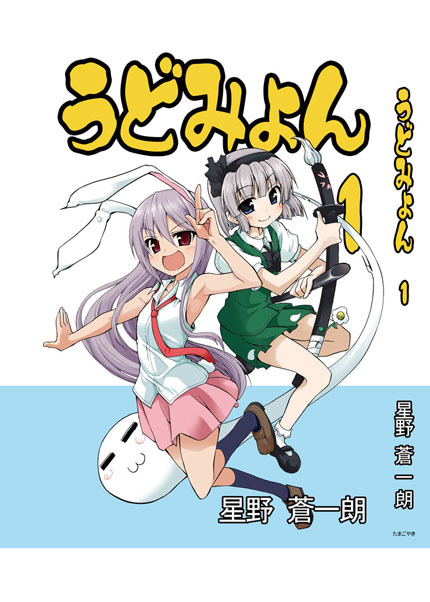 Kira (my publisher, and America’s Queen of Yuri): So you’re doing a Youmu x Reisen book? Me: I just barely started, but yes, kind of. Kira: Do you know Winterbraid? Me: I think I’ve heard the name. Kira: He’s a close friend of mine, who runs a site called Ghost Yuri. Me: So I’m guessing he prefers Youmu x Yuyuko? Kira: More like he insists on Youmu x Yuyuko only. If I print a Youmu x Reisen book, he’s going to be furious. Curry Udonge by Soichiro Hoshino. Me: So you wouldn’t print my Youmu x Reisen book if I wrote one? Kira: Oh, I would totally print it. This is business, and people love Reisen, regardless of what Winterbraid thinks. Wriggle (Scott “OverCoat” Porter in Wriggle cosplay): You must be Sixten. Me: I am indeed Sixten. Wriggle: I’m OverCoat of the shrinemaiden.org forums. It’s nice to finally meet you in person. Me: It’s nice to meet you too. Wriggle: Your doujinshi are awesome. Give me a copy of each. Wriggle: It’s so awesome that Americans are making their own doujinshi. Me, I do a radio show and play Toho arranges. (Gives me a decal of his radio show.) It’s Tuesday at 5 PM on Arecibo Radio. Me: I’ve heard that name. 5 PM what timezone? Wriggle: Pacific. I do it right here in Seattle. Me: But of course. I was just confused, because Leo had mentioned that radio station, and thought it would be affiliated with him in Brazil. Wriggle: By the way, you mentioned you were working on a Youmu x Reisen book? Udomyon anthology by Soichiro Hoshino. Wriggle: Youmu x Reisen is super popular. You’ll sell a lot. 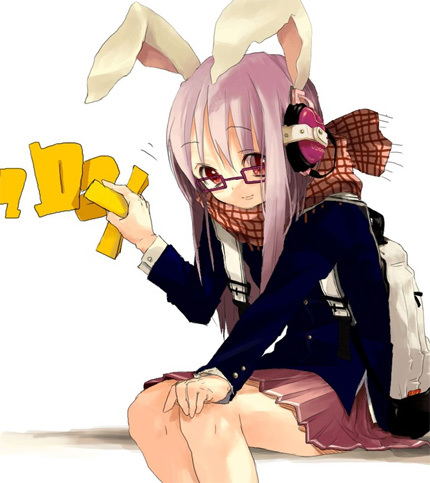 Reisen (10-year-old girl cosplaying as Reisen with glasses, I am not making this up): (Picks up a copy of Autumn Children) Are you the one that made this? Reisen: Got any books with Reisen in them? Reisen: There, that’s better. (Sets the copy of Autumn Children back on the stack.) The Aki sisters aren’t very popular. I’m surprised you did a book about them. Finish your Reisen book and I’ll buy it. Me: Did I just get told by a little girl? Kira: I think that girl might be a… special case. Later, my brother got back to me with a semi-historical fiction plot featuring an empire like Ancient Rome before its fall. There would be medieval battles, but no mythical creatures or spellcasting, and the hero would be an initially idealistic war leader who eventually resorted to dirty tricks in order to rewrite history and keep the empire together. It would be unlike anything I had ever done before, and most importantly, it would be original. I couldn’t build my career on Toho alone, now could I? But I won’t be working on that just yet. Use Your Illusion will be continuing shortly. This entry was posted on Sunday, April 7th, 2013 at 6:57 pm	and is filed under Announcements, Toho. You can follow any responses to this entry through the RSS 2.0 feed. You can skip to the end and leave a response. Pinging is currently not allowed. Those con goers definitely knew what was what.